"Crash course on the Middle East"
Is the Gulf of Mexico Oil Spill An Extinction Level Event? It sounds like the plot of a cheesy B movie, one no decent person would ever be caught watching even in the privacy of their own home with the shades pulled and volume down really low. A large corporation somehow messes with the environment and threatens to destroy the planet, mainstream media covers it all up, and one scientist, whom no one will listen to, figures the whole thing out just in time to save the day. With help from a group of misfits of course. Except this time, the disaster is real. The characters are nearly set as well. In the role of the catastrophe is the Gulf of Mexico oil leak. BP and Haliburton are sharing the part of the evil corporation. The Scientist would be Paul Noel, a Software Engineer for the U.S. Army at Redstone Arsenal in Alabama, who has made statements suggesting that he believes that the oil pocket hit will be impossible to contain. The group of misfits... well, it could be anyone. There is even a secret document that has leaked to the Internet. Yes folks, this story has it all. The National Oceanic and Atmospheric Administration`s Emergency Response document, which is exactly what it sounds like, is dated April 28th and claims the scope of the spill is far worse than the public is aware of. Somewhere, Michael Bay is wondering why he didn`t think of this first. The words "Extinction Level Event" have been used in recent articles to describe what we are facing. To scientists that means a whole lot. To the rest of us it is just a bunch of pretty words. Cue the part in the movie where the entire crazy disaster is broken down using a familiar metaphor that even the dumbest of the population can understand. Imagine you`re having a party and buy a keg of beer. Some joker decides to pour a quart of motor oil into the keg. Now imagine that party is the people of the Earth and the keg of beer is our water supply. The joker, of course, would be BP. How long before the party is over? Extinction Level Event, folks. On par with the meteor that took out the dinosaurs. That is what some say we are facing at this very moment. The end of life as we know it, a full two years before the whole crazy 2012 movement expected. And that, good readers of the Internet, is how the story of our grand civilization could end. Instead of a nuclear war or rogue meteor, we could be smothered in the very thing that our greed led us to believe we couldn`t get enough of. Or maybe this is all sensationalism. A conspiracy of a few random journalists with absolutely nothing in common created to scare the masses. Time will tell, but as of now, it is not looking very good for the latter explanation. A swarm of "thousands of bees" gathered outside the White House this morning. The small army of insects hovered as Obama tried to leave the White House to play basketball at Fort McNair, according to a pool report. By the time the president returned at noon, the bees were apparently nowhere in sight. Apparently, the era of fly-anywhere-anytime air travel has come to an end. THE Icelandic eruption that has caused misery for air travellers could be part of a surge in volcanic activity that will affect the whole of Europe for decades, .... At least three other big Icelandic volcanoes are building towards an eruption, ...all of which are bigger than Eyjafjallajokull. In the past, they have proved devastating. "Thoughts on the Book of Ruth"
What is it about the Book of Ruth? The story is so understated! "And it happened in the days when the judges judged.... A man went from Bais-Lechem in Judah to sojourn in the fields of Moab, he, his wife and his two sons...."
Such quiet and simple words ... such awesome power! Can you imagine that King David could come from Moab, the most depraved nation, founded in unspeakable shame and ignominy! From this depraved nation comes the seed of the Messiah? This is the LAST place you would look! I don't know if we take seriously how enmeshed we are in the impurity of Exile. We don't even begin to realize how far away we are from the world of sanctity in which the Holy Temple existed, a world of purity in which the King of the Universe was accessible to us. We are so buried in materialism that we find it extremely difficult even to believe there could ever be a world of total purity and sanctity, let alone that we could live in it. Can we even imagine the Garden of Eden? It is a fairy tale to us! And yet that is exactly how G-d created the universe, and that is exactly how He desired that it should exist, in that condition of absolute purity and allegiance to His will. My friends, there must be a way to get from here to there! There must be a way to get from Exile to the perfect world that G-d created and that we have since ruined! It would seem that the Messiah's task is to bring us from here to there. And that perhaps is a clue to the meaning of the Book of Ruth, for part of King David himself comes from that utter depravity called Moab. That is one part of King David. The other part is Boaz. Who is Boaz? King David came from Ruth and he came from Boaz. We can understand Boaz, but why Ruth? Why does the Messiah have to come from a nation which epitomizes the utter depths of impurity? G-d sent Fathers to the Jewish People who would shepherd us with a spirit of self sacrifice! G-d Himself entered Exile with us! "I shall descend with you to Egypt." (Genesis 46:4) Do you think that someone who has not felt the impurity can bring the children out? Will He send someone to take us out who has not been in Exile himself? Unless the redeemer has himself been in Exile, unless he himself has felt the utter emptiness, the torture and depravity, the hopelessness, how can he lead his brethren out? How can he speak the language of those who still wallow in the quicksand? So King David HAD to come from Moab, and this is the amazing message from the Book of Ruth! The darker the night, the brighter the dawn! On Shavuos we learn through the night, and in that merit may we soon see the everlasting dawn of the coming of the Messiah, the rebuilding of the Holy Temple and the day when the King of the Universe will restore his Presence to Zion! What a day that will be! The world will be renewed, all impurity will be removed forever and we will rejoice in everlasting unity with the Holy Torah in the Land of our Fathers. May G-d send the Redeemer soon in our days, "l'ma'an shmo b'ahava," for the sake of His Name, with love." 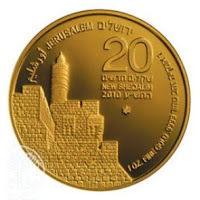 Israel now has its own gold coin. "Grey Whale Sighting off Israel's Coast"
This is obviously another sign of something, but what? Any ideas??? As I read the reports about Sholom Rubashkin's trial, I can't help but think that this is Pollard all over again. Yes, he broke laws, but not maliciously. I have to say though that at least Jonathan Pollard was trying to save the entire Jewish people, not just a business venture. But again, it looks like the Jew will get a highly disproportionate sentence as a lesson to others. I also can't help but compare the outcry from the frum community in support of Rubashkin as opposed to the resounding silence as Pollard met his fate. Perhaps this is happening in order that the Jewish people will draw this conclusion: "You know, this is exactly what happened to Jonathan Pollard, but we did nothing to help him." It's not too late to make amends for that lapse in judgment. You can't throw one Jew under the bus and then expect Divine help to save another. These men are two sides of the same coin. We are all parts of one giant organism. What affects one, affects all. We have to learn this if we never learn anything else. As Jews, our fates and our destinies are intertwined. Perhaps, if there had been such an outcry from the Jewish community in response to the Pollard life sentence, a Rubashkin life sentence could never have been considered. Instead, the injustice to Jonathan Pollard set a precedent for all Jews. If you are a supporter of Sholom Rubashkin, ask yourself, "What did I ever do for Jonathan Pollard???" "I'm glad that you did not bring tefillin with you, but not for the reason that you probably assume. You might be thinking that I would interpret bringing tefillin into Marion as a means of coercing me to put them on. I very much want to put them on. But recently, when I put on tefillin in my cell the guards pried them loose from me and opened up one of the Batim to the Shel Yad. This was done despite the fact that metal detectors don't permit anything to enter which could be used as a weapon. So, obviously, the guards knew in advance that they were not going to find anything that would place either them or me in danger. They just don't appreciate any demonstrative expression of Judaism. Had we all put on tefillin," Pollard continued, "the guards would have conducted themselves in a civil manner while you were here, but immediately after your leaving I would have been subjected to taunting and perhaps a few physical blows. What I do now from time to time, is draw a curtain in my shower to hide myself for a few moments and then put on my "Shel Rosh." Pollard, who is an observant Jew in a federal lock-up, cannot practice his religion as do those who are free, or even in a limited way as is possible in state prisons. He is strictly kosher. For food he is offered what is known as "common fare" which is often inedible and, often, not too kosher. He relies on friends who send money to his canteen account. This permits him to purchase tuna, sardines and other kosher foods at highly inflated prices. Jonathan, who wears a yarmulkah in prison, cannot daven with a minyan, wear a talis and tefillin or have access to Hebrew texts. Jonathan has a close personal relationship with Rabbi Mordechai Eliyahu, the former Chief Rabbi of the State of Israel. Rabbi Eliyahu has told Jonathan that in his case the possuk (verse) in Tehillim (Psalms) of "Gam ki elech begay tzalmaves HaShem lo eerah ra ki ata imadi" (English: "Yea though I walk through the Valley of the Shadow of Death, I will fear no evil for Thou are with me") must be read with a period before the word "ra" (evil). Thus the verse reads: " What is Evil is that You are with me" - or in other words that the Shechina (the Presence of G-d Himself) is suffering with Pollard in jail. Rav Eliyahu explained that it is bad enough that the Jewish community has been largely indifferent to the suffering of Jonathan Pollard, but it is "unspeakably evil" that we do not have pity on the Shechina which is Jonathan's prison mate. "Where we now stand is stolen, occupied Mexico"...La Raza rally at UCLA. The oil spillage in the Gulf of Mexico threatens to become the greatest-ever catastrophe of its kind. The next disaster is here and it's a gusher...literally. "Deepwater Horizon" is the name of an offshore drilling rig like the one pictured. It was located in the Gulf of Mexico near the Louisiana coast when there was an explosion and fire and it subsequently sunk on April 22nd. It was the deepest well ever drilled, more than a mile below the surface of the water, extending some six miles into the earth's crust. No one knows if it was caused by equipment failure or terrorism, but all you need to know now is that this "gusher" is pumping 25,000 barrels of oil per day into the ocean and nobody knows how long it could go on or how to stop it. They're calling it "Obama's Katrina." ...The problem with the spill that followed the Deepwater Horizon explosion is that it isn't a spill: It's a gush, like an underwater oil volcano. A hot column of oil and gas is spurting into freezing black waters nearly a mile down, where the pressure nears a ton per inch — impossible for divers to endure. Experts call it a continuous, round-the-clock calamity, unlike a leaking tanker, which might empty in hours or days. "Everything about it is unprecedented," said geochemist Christopher Reddy, an oil-spill expert and head of the Coastal Ocean Institute at the Woods Hole Oceanographic Institution in Massachusetts. "All our knowledge is based on a one-shot event. ... With this, we don't know when it's going to stop." It was revealed Friday that British Petroleum (BP) had downplayed the possibility of a catastrophic accident at the oil rig. In its 2009 exploration plan and environmental-impact analysis for the well, BP suggested it was unlikely, or virtually impossible, for an accident to occur that would lead to a giant crude-oil spill and serious damage to beaches, fish and mammals.